Congratulations on being admitted to the U! Celebrate your success with us at one, or more, of our admitted student events. You will have an opportunity to meet your new classmates, learn about the value of a UM education, and get answers about the next steps to becoming a ’Cane. Please check back periodically for dates on the next ’Cane for a Day Sessions, Future ’Cane Days, and Regional Receptions. ’Cane for a Day is a one-day program, where you can experience firsthand what life is like as a Miami Hurricane as you are matched with a current UM student. Celebrate your success with us at one of our Future ’Cane Days, our admitted student open houses. Meet your new classmates, learn about the value of a UM education, and get answers to next steps. Can't make it to Miami? 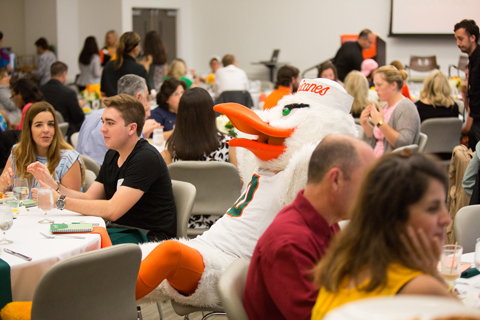 Attend a regional reception in your area where you will meet future classmates and learn more about living and learning at UM from admission counselors and alumni.